People born under the Leo Wood Dog sign are generous. They are not hesitant to give more than others. They have a strong sense of loyalty so don’t worry about them stabbing you in the back, in fact, they will probably save you from it. LWD’s are constantly growing and will continue to seek out knowledge and skills to help better themselves. They are very confident and have no problem acting on their own without worrying about what others may think. 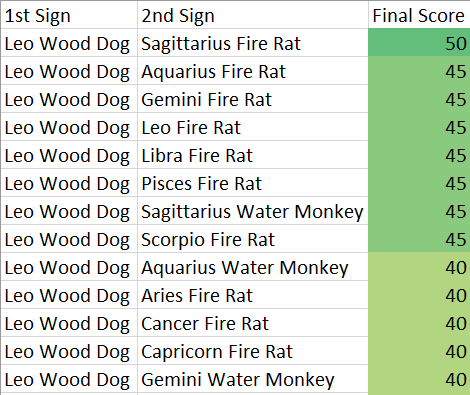 Last but not least, the Leo Wood Dog is one of the most honest signs and they will hide no secrets from you nor tell lies to attain what they want. This sign is unpretentious and they won’t steal the spotlight. In fact, they sure know how to make others shine. On the other hand, the Leo Wood Dog sign has a tendency to dominate people. They may ignore other people’s feelings and force their way through to obtain what they desire. Their arrogance will make them think highly of themselves which can sometimes hurt others around them. LWDs can be easily overburdened. They tend to take on more than they can handle. They can also be passive and not care about situations that may need to take action. Worst of all, the Leo Wood Dogs can become pessimistic. They tend to complain about how it is not fair that their lives are less fortunate than others. The hound is head-strong and sometimes it is difficult for them to break away from their strong convictions.